Properly installed furnaces are expected to work at utmost performance even in extreme weather conditions. When installation goes wrong, your investment and comfort can be compromised. 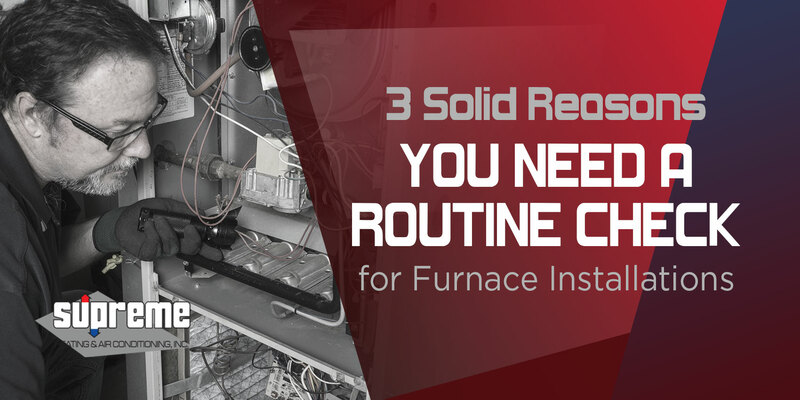 Your furnace may act up in the middle of the cold season with poor installation. This is why a routine check and tune-up on your furnace is extremely important. Below are three (3) main reasons why it is necessary to have your heating system checked and serviced regularly. You can cut your energy costs in about half when your HVAC system works well as expected. But for furnaces with poorly maintained parts, they have to work double than their normal operation to reach your comfort level. When your furnace is regularly checked and maintained, you will achieve higher savings on your utility bills. Get a professional inspection service to ensure that it’s always up for the task. The purpose of installation checkup is to assure that your system reaches its timetable. With a complete system inspection, you are alerted of hidden issues so you can make prompt solutions. Any issues in your unit must be addressed immediately. If neglected, it could result in severe damages and costly repairs. Hence, always put furnace inspection on top of your priorities if you want your unit to survive longer as it should. Maintaining heating and cooling systems require you to pull out some cash from your pocket. But if maintenance is done ahead of time, there is no need to spend money either on repairs or replacement. A routine check on the system prevents you from unexpected circumstances like sudden repairs. Be sure to get a certified contractor to perform the inspection for best results. It takes the hands of experts to guarantee the utmost performance of your heating system. If you need professional furnace inspection, we are here to lend a hand. Call us at Supreme Heating & Air Conditioning, Inc. for more details.